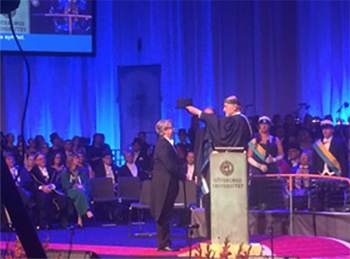 Karen Barad received an honorary doctorate in the Arts at the University of Gothenburg in Sweden. Karen Barad--professor of feminist studies, philosophy, and history of consciousness at UC Santa Cruz--also happens to have a Ph.D. in theoretical particle physics and quantum field theory. The author of Meeting the Universe Halfway: Quantum Physics and the Entanglement of Matter and Meaning, she has published numerous articles in the fields of physics, philosophy, science studies, and feminist theory. Over the past month, Barad has received multiple honors in Europe for her work. She first received an honorary doctorate in the Arts at the University of Gothenburg (Sweden), followed the next day by a symposium held in her honor, titled “How Matter Comes to Matter," on her theory of agential realism. A few days later, a conference was held in her honor at the University of Aarhus in Denmark. She then presented the Futures Lecture at that institution, a series that seeks to present some of the most interesting thinkers in the realms of the arts, humanities, and social sciences. The title of her talk was “Troubling Time/s, Undoing and Re-membering the Future”. Finally, on her flight back home, she learned that she had received an invitation to be on the summer faculty of the European Graduate School, founded in Switzerland by the non-profit European Foundation of Interdisciplinary Studies. “I spent the first half of my career in a physics department,” Barad noted. “But I was interested in asking larger questions, including questions of social justice in relation to science, and I found a lot of resources in thinking about philosophy and other aspects of the humanities and social sciences." “I never left physics,” she added. “My research engages questions of the foundations of quantum physics and questions of social justice. The pressing problems of the world don’t fit inside individual academic disciplines or divisions, and so I have been working to develop ideas that speak across these divisions we call the natural sciences, the humanities, the social sciences and the arts." To learn more about Karen Barad’s research, visit the Science and Justice web page or her UCSC faculty page.